17"wide x 11"deep x 18"high. 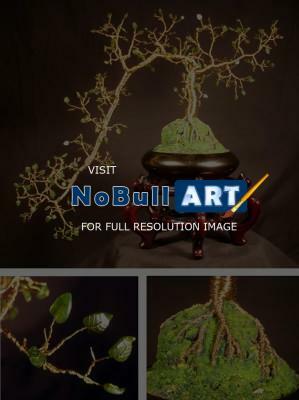 Wire tree sculpture with 218 genuine Jade leaves of various shapes and sizes. Some of the jade leaves are flat and others have a slight upward turn at the tip. Each leaf is individually wired onto its branch using a unique method developed by Sal Villano expressly for this type of sculpture. There are no holes in any of the leaves so they appear very natural in their position on the end of each twig. The tree is created using 18, 24 and 26 gauge gold color wire. The roots of the tree are bound into a sand and pebble mound that is painted in greens and yellows using India ink to create the image of moss. The sculpture is in a 7" round metallic finished ceramic bowl and is permanently fixed to the dark wood 5 legged elevation base. This sculpture can and should be displayed in direct sunlight since all the coloring and material used are light fast, and will not fade. This is a one of a kind original sculpture by Sal Villano. Salvatore Villano is willing to sell this fantastic piece of art. These are really nice! Appreciate the work put into these.